Tonight I’m trying a new recipe I found on the Pioneer Woman website. 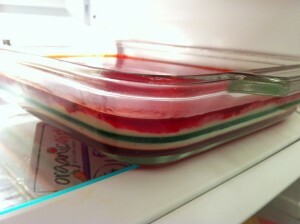 So far it looks right but the second layer of the sweetened condensed milk had gelled too much. I tried microwaving it for 20 seconds and that sortof helped but I didn’t want to overdo it so that layer is lumpy. But, the layers taste DIVINE ! !